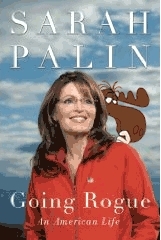 The book also fails to expose Mrs. Palin's intellectual brilliance and keen grasp of foreign policy issues. Why wasn't the text of her recent speech in Hong Kong included? Although it remains secret, it's rumored that she viciously rebuked the Vietcong king for his assault on the Empire State Building. That's a speech we've been waiting for nearly 75 years to hear. It's big news and should have been included. ...a few bad reviews won't stop her. She's seen much worse from her kitchen window. It can't be pleasant to gaze upon Antichristograd every morning as you brew your coffee. We all love Jesus General. You might also enjoy/recommend his review of Carrie Prejean's book. Priceless.